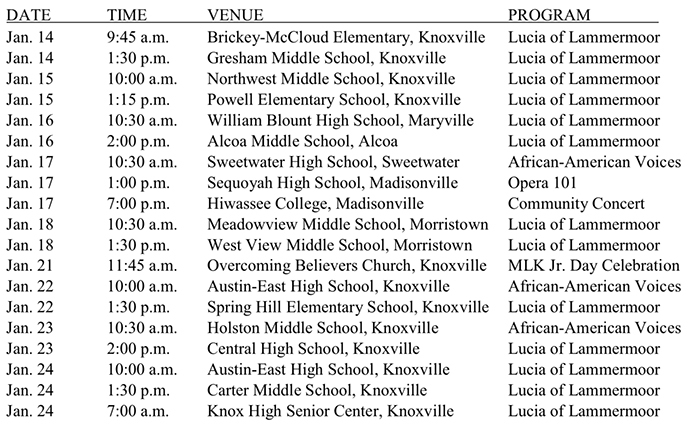 For the eighth consecutive year, Knoxville Opera will bring a staged opera into East Tennessee schools in January. This season’s production, scheduled to be experienced by 8,000 students in six counties, is a 40 minute, abridged English-language version of Donizetti’s 1835 opera Lucia di Lammermoor. Teachers have already received a Teacher Guide to help prepare students for the performances. After watching the tale of a star-crossed romance set in 16th century Scotland, each student will receive information about the full version of Lucia di Lammermoor which will be performed at the Tennessee Theatre on February 22 and 24. The complete opera will be sung in Italian with English translations projected above the stage and students are invited to take photos with the cast on stage after the performances. The free student admission Final Dress Rehearsal takes place at 6:30 p.m. on Wednesday, February 20. Accompanying adults pay just $5 cash at the door. A limited number of free student tickets to the performances are available by calling Knoxville Opera at (865) 524-0795, ext. 251.